“It’s a baby-saurus! Run!” The screeches come echoing through the living room. My preschooler son and nephew desperately scramble across the floor, with my nine month baby girl in hot pursuit. She tucks her head down, gurgles, and puts on her turbo-crawl speed. Who knew her little hands and knees could move so fast? As the boys hide behind the pantry door, I watch my baby, curious how she’ll respond. I see her slow her stride, skillfully plop down on her round bottom, and then slowly pull the door open. She catches my eye, smiles, and then peers in at two pairs of toes peeking under the pantry door. Success! “Baby-saurus” wins again as the three of them explode in fits of laughter. Sound familiar? If you’ve got a baby around nine months old, get ready for the age of adventure! Gone are the days of just watching. Your nine-month-old is firmly in the stage of doing. Crawling, scooting, cruising, pulling up. Filling, emptying, munching, babbling. 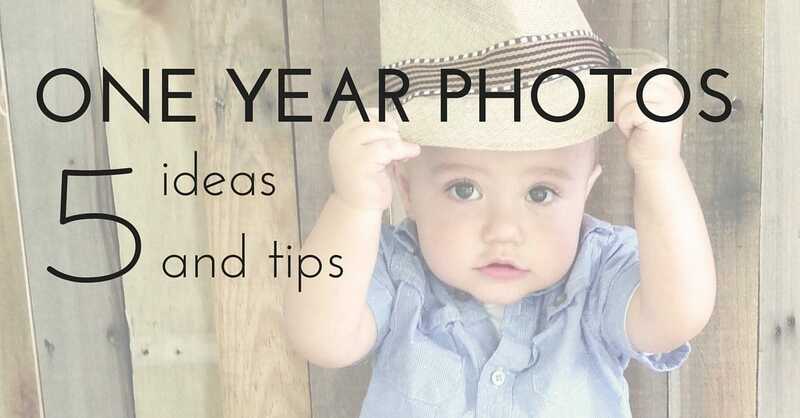 There are a ton of things to do if you’re a nine-month-old! We love new skills! But the routine and schedule hiccups that come with all these new skills? Not so much, mama. In addition to all these new skills, your baby may be experiencing the height of separation anxiety. This can make transitions a tricky part of your daily routine! Whether you’re nursing or bottle feeding, sometimes baby just wants mama! And teething. Oh, the teething! All of this adds up to some major shifts in what your day looks like with baby. At nine to twelve months of age, your baby is most likely on a four-hour schedule with nursing sessions or bottles. A three-hour schedule is still OK, too! Follow your baby’s lead. Sometimes we even alternate between three or four hours in between nursing sessions. Remember, your routine serves you. You’re not meant to serve your routine. Doesn’t it seem like just when you’ve got the hang of this whole baby schedule everything turns on its head once again? No worries, mama. 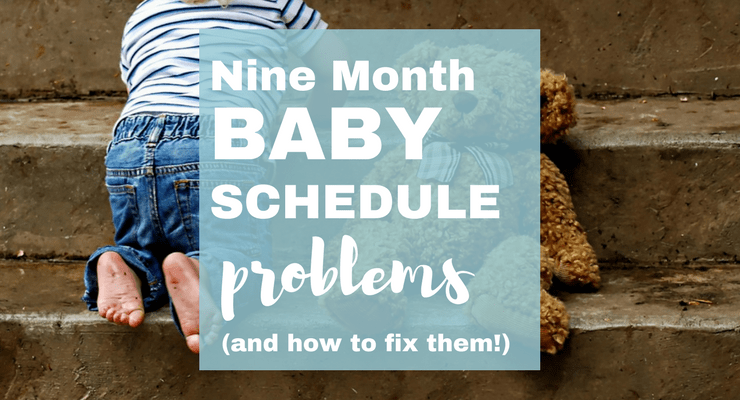 Let’s look at a few of the scheduling problems that pop up for nine-month-old babies. 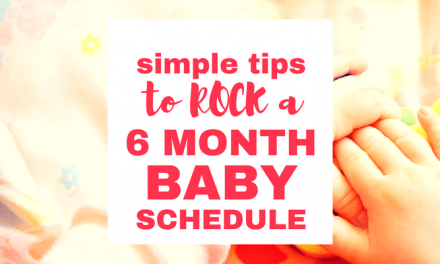 And I’ll give you my best tips to adjust your nine month old baby routine for the best results possible! With a three or four-hour stretch before bedtime, your baby may be pretty fussy in the evenings. But, two naps a day are plenty for babies of this age. You don’t want your child to get too much sleep during the day, since this may encourage night waking again. What do you do with all that fussiness when bedtime is still a few hours away? Solution: Adjust bedtime if necessary, and soothe your baby! To tackle those fussy evenings, try keeping your baby engaged and soothed as possible in the hours before bedtime. Go on a walk while dinner is in the oven, or play on the back porch if you’d like to get outdoors. If you’re stuck indoors try activities that won’t over-stimulate your baby, but won’t leave her bored either. Puzzles, books, or our favorite magnet blocks are all great options for keeping those evening blues away. Sometimes we even eat dinner on the back porch to beat those evening fussy moments. Nature is so calming, and my baby enjoys looking at the trees and clouds while she eat in her high chair. Problem #2: Baby fights bedtime! 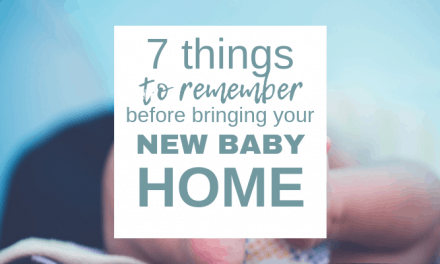 As your baby grows older, he may start to realize that he has this crazy thing called a “will!” As they say, “Where there’s a will, there’s a way.” Sometimes our babies simply decide they’d much rather stay up with the rest of the family than head to bed. Or your baby may start to cry when you leave the room, simply because he wants to keep cuddling! Solution: Create a soothing, positive bedtime routine. Stick to the plan, mama! With my daughter, we started to see the signs of the dreaded nine-month sleep regression. Middle of the night wakings, crying when I put her in the crib at bedtime, all of these signals pointed toward some major sleep changes coming our way. Thankfully we had worked really hard to set up good sleep habits from the beginning. We put these habits to work again, doubled down on creating positive sleep associations, and within a few weeks were back to our normal peaceful nights and naps. If you’re struggling with sleep habits, it’s not too late to start! 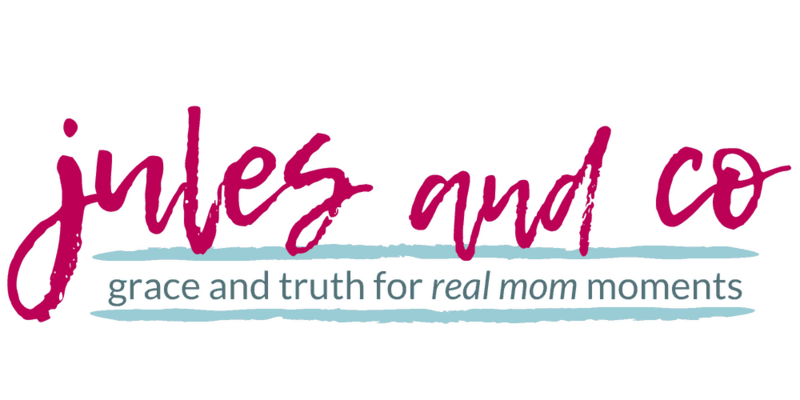 Read this article about the mistakes I didn’t make with my second baby, and what I did instead to encourage great sleep habits! My favorite sleep training book is The Happy Sleeper. This book has a really helpful and balanced way of looking at sleep training. One of the strategies in this book is called the Sleep Ladder. It starts with this idea of doing the least intrusive thing to help your baby sleep. If you want more details about these baby sleep strategies, be sure to check out the book The Happy Sleeper! With my son, sleep never came easy. You see, I didn’t learn all those helpful techniques for the early months until my daughter came around! However, the one thing that has always helped my son sleep was a predictable routine. When he was nearing on his first birthday, I started praying Psalm 19 over him as I laid him in bed. When we combined this with his usual bath, nursing, and prayers, he responded much better at bedtime! Whatever your normal bedtime routine is, consider adding in a calming, special mini-tradition to help your child look forward to bedtime. What about you? 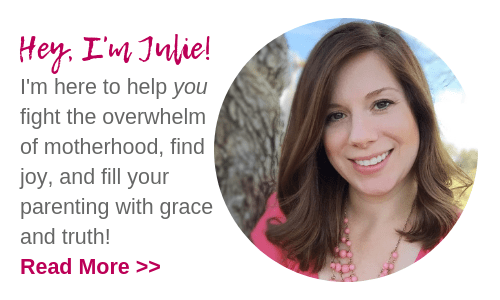 Is your nine-month old giving you a run for your money? Take heart, mama. You can do this! 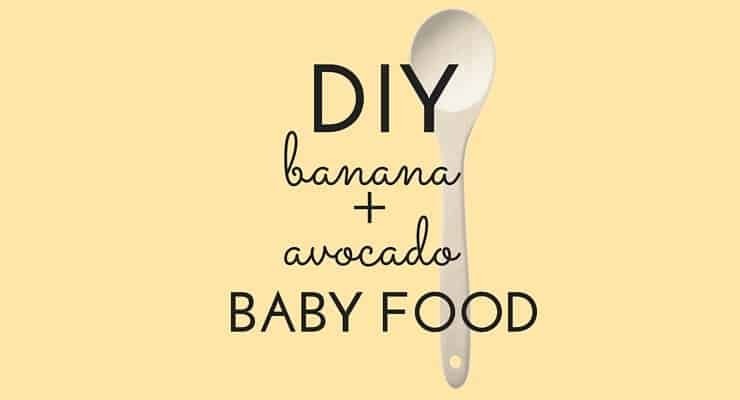 Enjoy this sweet and busy stage of your baby’s development. 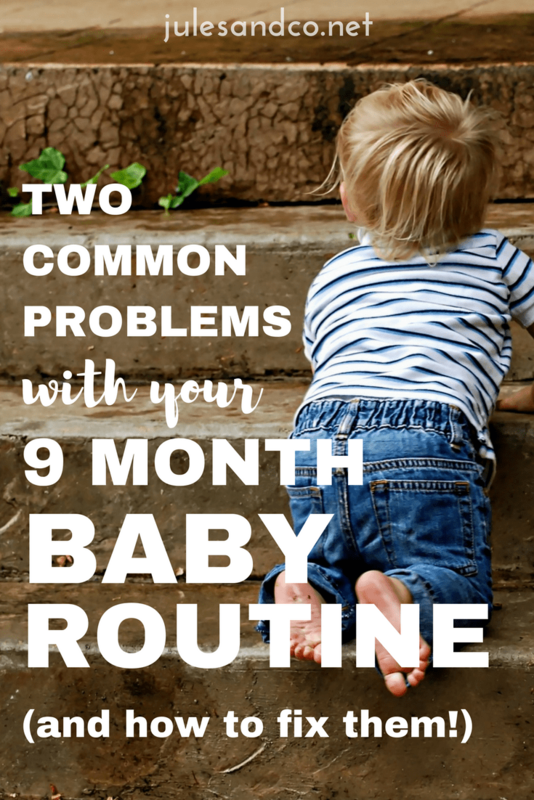 Share below, what does your nine month old baby’s routine look like? 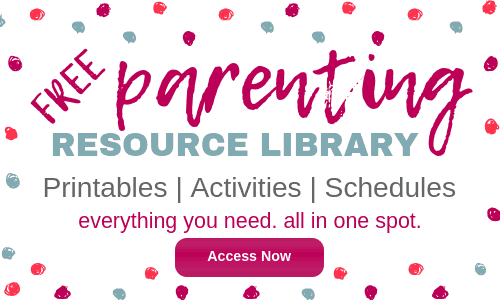 What’s the biggest struggle in your baby’s schedule right now? Next15+ Toddler Process Art Projects so Easy They’ll Make You Love Pinterest Again!